Books Order from Small Press Distro by clicking here. It’s like Noah Eli Gordon brings an abacus to calculus class. To seminary. To couples therapy. To band practice. What is it for? His tabulations, his many rearrangements of the beads, sound like solving. I love their deliberateness, undeceived about how absolute the quandary continues to be. 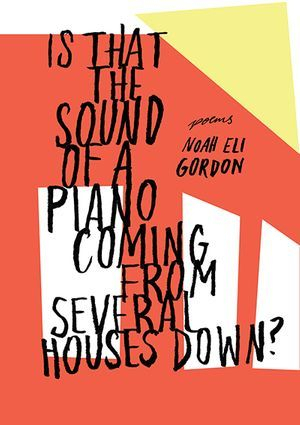 “The devil is in the details” is not a phrase that I feel I fully understood until I read Noah Eli Gordon’s clever book, Is That the Sound of a Piano Coming from Several Houses Down? The problem is, as Gordon might write, that the devil, while enjoying his/her residence among the details, has no necessary relationship to them. Injection of a strange, vivid consciousness into the bureaucratic nihilism of our times is just one of the achievements of this subtle, unflinching collection. I recommend reading it for the elegant patterns and power-washed prose, as well as for its extremely useful descriptions of the fine line between paradox and hypocrisy. There's a video for each page at the book's Instagram account that you can view by clicking on this sentence. I wrote this book over the course of a few manic days in 2005. It's an experiment in ambiance, lineation and energy exchange, a book-length poem that alternates prose and verse sections. The prose rewrites the opening salvos of Spinoza’s Ethics through a conversation between two people walking around a parking lot and talking about dogs, an actual dog in someone’s yard, and people in a theater watching what turns out to be a film about two people walking around a parking lot and talking about dogs. The verse takes as a formal and procedural model the exchange of electrons to create energy as documented by the writings of Niels Bohr, attempting to replicate this exchange through the redeployment and exchange of the utterance within the poem’s own sonic, rather than atomic, structure.Or something like that. I used to drink a lot of coffee. Eileen Myles, Alice Notley and Clark Coolidge were among the poets I looked up to as a youngster. When I think of poets from my generation who bring that same shock of living magic, Noah Eli Gordon tops the list. I’m always excited for his latest book, each a departure for unknown terrain. This is essential poetry, which is an urgent way of saying highly recommended! Inside this kingdom there is a syntactical logic that radicalizes ontological concerns, a sensation of waking under marvelous pressure, hills of storks and swans and lions, various collusions and collisions mapping the breath-spaces between words. I've known Noah ever since he was a flower on fire. This book burns. With humor, anger, intelligence & wonder, The Word Kingdom in the Word Kingdom is a quiet masterpiece. NEG writes with such a high level & understanding of craft & technique that you can pick any page at random & spend the rest of your life staring into it like a solar eclipse. "It’s like being inside the mind of language." "Exuberant, sometimes chaotic, and often disturbing..."
Tracking the motions of these witty, reflective poems is like wandering through a chambered nautilus with a Virgil in a crisis of self-doubt about his mission. The nautilus resembles a mirrored city, then a garden, or it's sliced and pinned to the wall as art, or hung up like a human in a suit or skirt whose self-fashioned day is morphing. Audacious and brilliant work. In the ocean of images a sonnet tide ebbs and returns while within that fearful symmetry identity picks a way between mirrors and windows grateful that thought has mergeable labels, that adjectives are nouns, and that no things abut ideas: The Year of the Rooster shall be your map and guide. "...controlled chaos of the most expert and intriguing kind..."
"...really kicked it up a notch." We read these words on page 26 of The Source, Noah Eli Gordon’s strange and haunting cento—a book assembled from thousands of instances of page 26, as found in the volumes of the Denver Public Library, their deployment of our alphabet with its twenty-six letters yielding an astonishing variety of source material that constitutes Noah Eli Gordon’s adventure in numerology. Language is literally charged with meaning in exciting new ways. Reduced choice is still choice, and we find what we look for. As Tzara said, describing a more strictly aleatory process of composition: “the poem will resemble you.” So Noah Eli Gordon has stitched hundreds of fragments into an intriguing, often funny synopticon of our culture and its/his nostalgia for transcendence. And though the book warns, "the Source is to be taken in very small doses," the total effect is exhilarating. Noah Eli Gordon's poems take the form of jotted notes in an artist's notebook (I was reminded in particular of Odilon Redon's). Each day one begins anew to weave the web, having moved a step forward (or sometimes backward) since yesterday's attempt. Thus each prose bloc, modified or modulated by the ghostly fragments that interleave them, sharpens the focus by which he "attempt[s] via the unknown to give grammar a purpose." The effort in itself is its own reward, and a prodigal one. Control being an on-going subject, vice, tool, & problem for poetry is at the heart of the speaker's mind in Gordon's book. When the poet says, "perhaps unreliability is the locus of representation," he's not trying to club you with irony, he's trying to figure out how the whole shebang, the big picture, hangs together. This book is about life, art, form, and perception. It functions musically, it's an amiable read, & I hope it damages you as much as it’s damaging me, gently speaking. In this collection of prose poems, Noah Eli Gordon's dark portrayal of what we've come to circa 2007 rings true again and again. A moribund psychosocial system has seldom been depicted with greater acumen and flair. You can fairly hear the pinging of the world and all its parts—noises of earth's objects rubbing against each other and the spheres. In this ebullient music find the translation of colors, shapes, space, speech, integrity, destruction. It's as if the world's most believable cape were thrown back and below we found not a sham of seasons but all the body's most dynamic possibilities. Such a new century deserves the sexual, the scientific, and the utterly secular pleasure of building a poem with the tectonics of a great bridge. So little pathos and so many paths. Broken like the heteronyms of Pessoa, but filled with multiple lives, Noah Eli Gordon teases all false monumentality yet reserves its rights to memory. To call it witty or wild isn't witty or wild enough and leaves out the cavalier, the paideia, and structural surge. He has the restless tones and narrative density of a septet. His work itself glows green with surprises. He is a painter, of course. I am inclined to read Noah Eli Gordon's new book from the perspective of a thousand years, when nature and artifice will have fused into bird-encircled circuitries of song. In other words, in other worlds, is where this writing's sand-clock accumulates its evidence. Yet Gordon demonstrates that, even as names fall away from their referents, they also claim the right of return. Here, every word holds its own echo, as if spoken inside a space helmet, and assumes a vexed convexity of mirror that allows the accidental to slide into the essential. They glitter. This book glitters. In Figures for a Darkroom Voice the rhetorical twisting of Noah Eli Gordon’s abstractions meld with the ominous narratives of Joshua Marie Wilkinson’s fragments, turning Wallace Steven’s notion of a supreme fiction toward a supreme friction, one where the work of these two poets is fused into a voice as singular as it is sinister. Imagine a gallery in which Cornell boxes talk back, a Maya Deren film in which the audience dissolves into projector light, a Philip Glass composition played exclusively on medieval weaponry, such are the compelling results of this collaborative work. Here, the slippage and disruptions of textually investigative work collides with the mind-expanding project of conjuring paradox, while never quite leaving linearity behind. When these poets write, “I am trying to draw you a simple picture of explanation,” one realizes the monumental nature of such a task. And this task is made more complex, and ultimately more rewarding, by the inclusion of Noah Saterstrom’s dynamic images. Can we, as poets, create texts about how we think and feel by using the language of how others think and feel? Can we compose with the new streams of language flowing in and around us (e.g. the ephemera and minutia of everyday email) to express our own place in the world? In a well-informed gesture beyond Baudrillard’s null set, Noah Eli Gordon’s booklength conceptual poem, INBOX, opens a new chapter of intimacy—his, yours, mine, ours. Welcome to a new subjectivity; welcome to a new way to say from the heart. It was the Russian Formalist critics who first noted that one of the historic roles of art – and one of art's inexorable drivers toward incessant, ongoing change – is to incorporate new aspects of society into the art itself. Without which any genre would very quickly lose much of its connectedness with the life of the community from which it springs. Inbox is exactly what its title suggests, a work of art that includes email received by the author, albeit written entirely by his correspondents, over a period of time. Sociologically,Inbox is fascinating. It presents the highest order of conceptual poetics just by being itself. 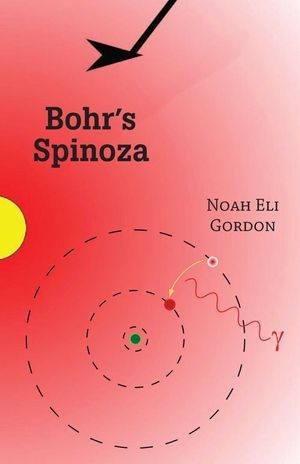 Noah Eli Gordon is a master of the shift between an epigrammatic and aphoristic line. Each utterance is a glance that implodes rhetorical strategies so spectacularly that the spray of intelligence that lingers in this reader's mind is not much different from a cooling shower from an illegally opened fire hydrant. Witty, vivid, and very, very vital, Gordon has entered a higher frequency. Occultists know that somewhere between heaven and hell is the diaspora known as daily life. Others might call it purgatory, but that doesn't come close to describing the many-hued weather Gordon inhabits. Remember the toothless man who said that his teeth picked up radio broadcasts? He was Jack Spicer’s cousin. Impish and generous, Noah Eli Gordon is a more distant relative, his family tree a new hybrid. He has honed his own very special antennae. It's not that he picks up broadcasts from the living and the dead, and from objects and extraterrestrials, all of which he does, but that he channels the voices of the lost and forgotten, the dedicated gumshoe with a nervous twitch, the last Saxon, the dead civilian, the dirty clown, and the dweller in the dunk tank. Hey Reader, do you ever think about the stragglers, hagglers, wagerers and waggers that Walt Whitman was unable to embrace? Don’t despair; they are pilgrims wandering through Gordon’s dense, constantly shifting musical landscape. After depositing their bodies in the wax museum of the everyday, they have (with Gordon’s help) become what they always desired—beautifully disturbing music. Noah Eli Gordon can spin, scratch, sample, and dub to mix a sound all his own. The Frequencies tunes in desire, poetry, static, and laughter--all the while broadcasting with the intensity and joy of first things. It’s dope. The Frequencies is the story of a boy and his radio and a whole lot more--Noah Eli Gordon tunes you in to the mysteries of great poets, great poems and good old fashioned love songs. This is the new music--listen to it.